Despite our generally-kept resolve to lay low and work on the business (for both productivity and safety reasons), Tony surprised me last Friday with a birthday trip extraordinaire. We were going down south to visit Tataouine (nope, I didn't misspell it. 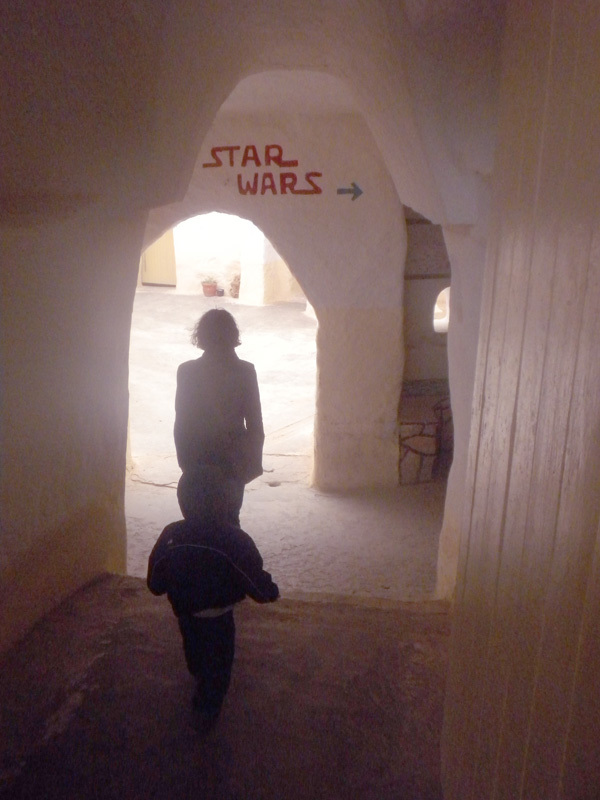 George Lucas did), which Lonely Planet describes as "the spiritual home of Star Wars." So we packed a couple of bags and a guidebook, and set off into the backwoods of Tunisia. Have I told you yet what a charming and varied country this is? Tunisia in February is already deep into the heart of spring. In between the evergreen olive groves, we passed fruit orchards in full bloom, and bright green fields covered with a sprinkling of tiny white and yellow flowers. As our road turned inland, the grass was replaced with red dirt, and then we reached pepper country. The red peppers that are the main ingredient for harissa hung in dark red garlands from the fronts of dozens of little shops. We also passed several mysterious tables stacked with plastic bottles filled with some unidentified liquid. We eventually realized that they were improvised gas stations. 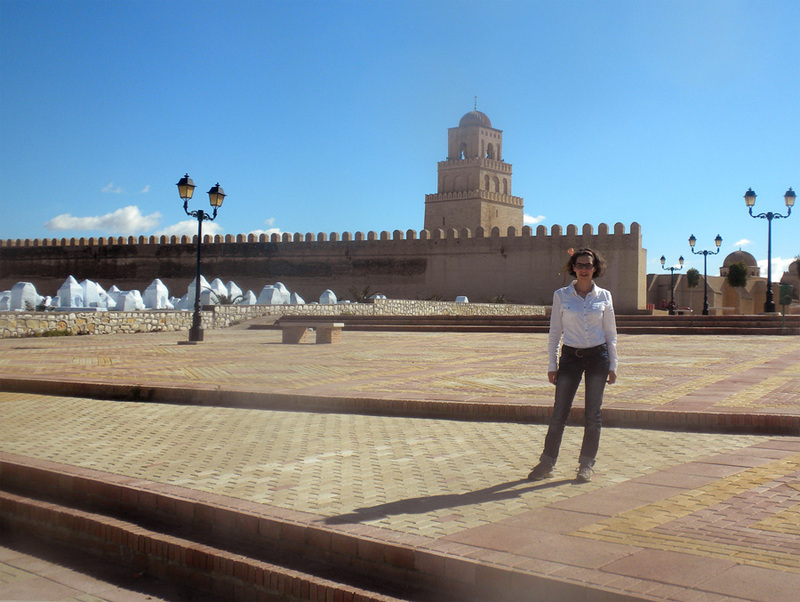 Our first sightseeing stop was Kairouan, the fourth holiest city in Islam. 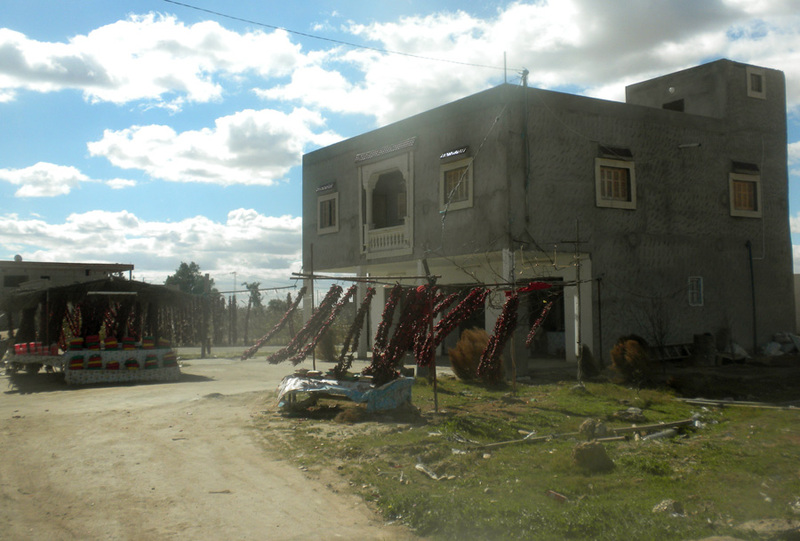 It is said that for Muslim believers, four trips to Kairouan are worth a pilgrimage to Mecca. I don't know if we'll be able to make it back three more times, but we're glad we went once. The Great Mosque looks like a sort of Timbuktu fortress, especially with the ancient whitewashed graves in front. 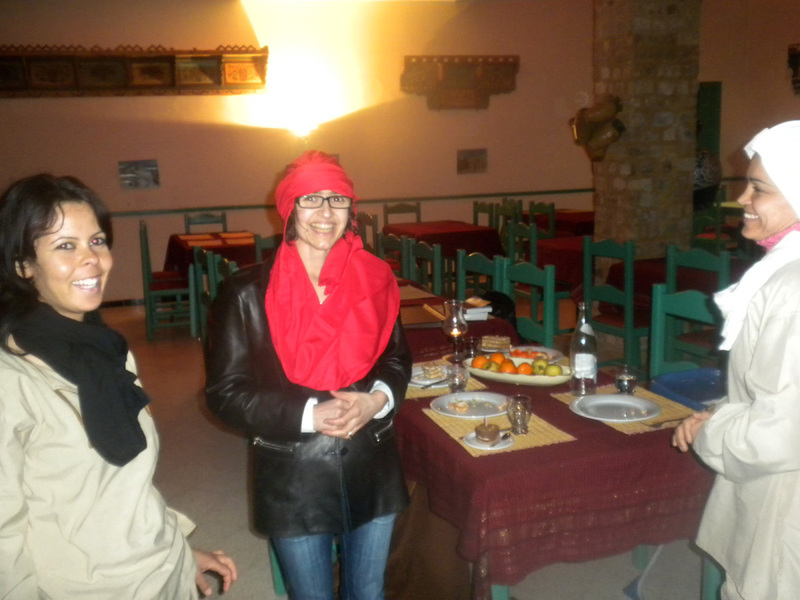 Kairouan is also famous for makroudh, a semolina pastry stuffed with dates and soaked in honey. Tony believes it to be the true and original version of fig newtons. 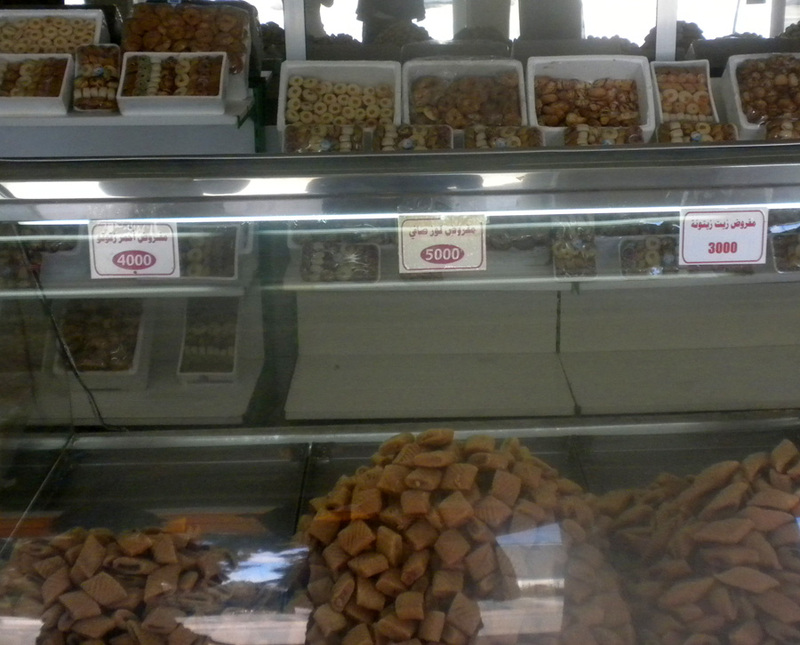 Of course we had to try an assortment, and found them to be tasty, although very, very sweet. As we progressed on our southward journey, the scenery became rockier and rockier, and we noticed more and more police and military. (Of course, it wasn't till we returned from our trip that we learned from our Foreign Service friends that the U.S. Embassy is discouraging travel to the south. Now I've finally broken down and signed up for the State Department's Smart Traveler program, so they'll email me the latest travel advisories. It's good to at least know these things.) Luckily, we were headed for what is really and truly the middle of nowhere. 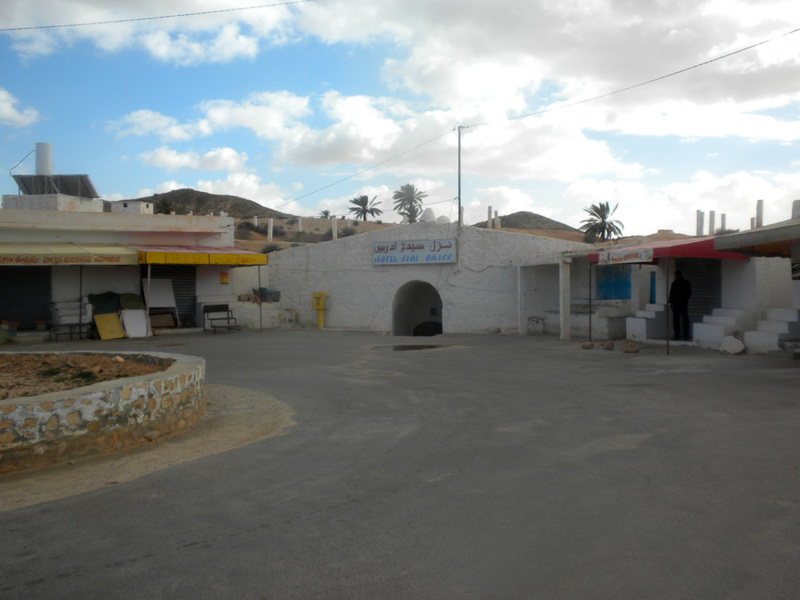 It's a little town called Matmata, where people actually still live underground. Just like Uncle Owen, Aunt Beru, and Luke Skywalker. Geek alert! If you aren't crazy about Star Wars, you may not find the following as fascinating as I did. 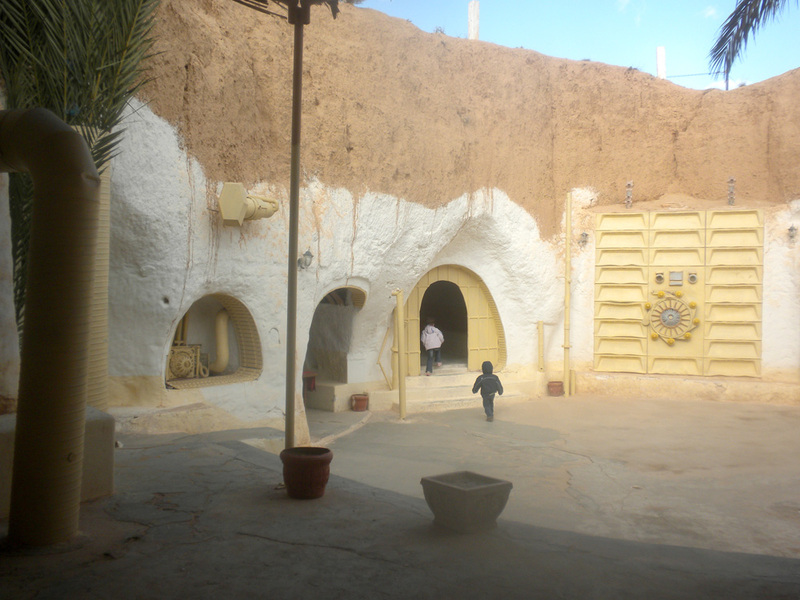 Although the local people are not "moisture farmers," many of them do still live in dwellings exactly like the one in Star Wars. They consist of a large courtyard, which is open to the sky, and then smaller rooms off the courtyard, which are covered, but a little dark and gloomy. I'm sure they're nice and cool inside, even in the summer. Right now the weather in Tunisia is breezy and sometimes a bit chilly anyway, even in the arid south. The house chosen by George Lucas for Luke's childhood home is now a rather grubby budget hotel (empty at the moment, of course). But the inside is remarkably well-preserved (O.K., I know we're talking about thirty years, not three millenia here, but still. It's a movie set!). The entrance to the hotel is a short tunnel that dips underground. 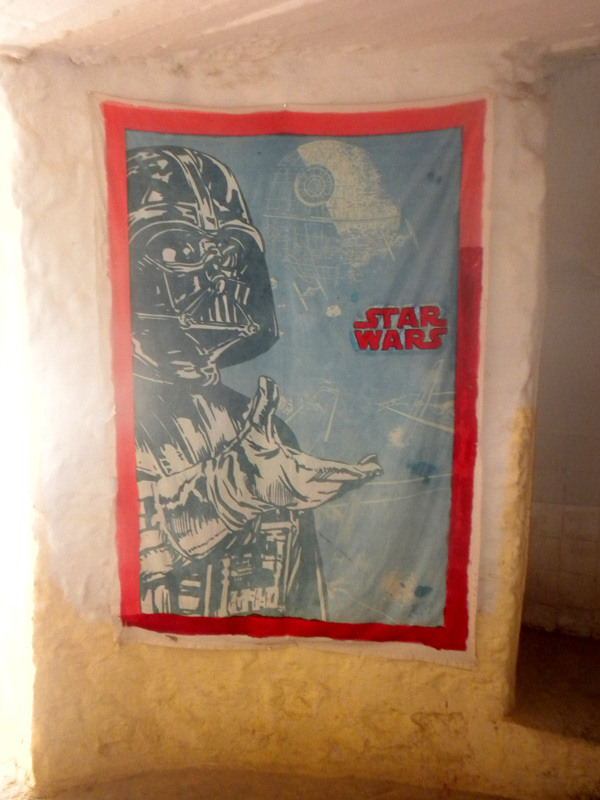 As you enter the tiny lobby, "Star Wars" is painted in red lettering, along with an arrow, which points you toward a hallway graced by a tacked-up sheet with a huge silkscreened Darth Vader. The impressive-looking faux door is still in place, as are all the other banana-yellow high-tech trimmings in the interior. I had to admit to myself as we entered that I may not be a true Star Wars fanatic, since I could not figure out exactly which room it was where Aunt Beru juices Belgian endive for breakfast. In fact, had I been a true Star Wars fanatic, I would have gone out afterward to scour the neighboring towns and bargain for recycled paraphernalia from the sets. Still, I have to say that there was no place I would have rather been on my birthday than in Luke Skywalker's living room. After soaking up the delicious Star Wars atmosphere (as usual, we were the only ones there), we exited the hotel and went around to look down into it from above, from which angle it looked even more like the movie. While we were there, a man came up with some sheepskins he wanted to sell us. They were really soft, and really cheap, and I'm sure he was telling the truth when he said he had sold nothing for forty days. So we bought one. And I've been sleeping with it ever since. Then we hopped in the car to get back to the main road to Tataouine. We reached the town almost at dusk, but we still had one place left to visit: Ksar Ouled Soltane, a fortified Berber granary. If you are like me, a granary hardly sounds like an exciting place to visit. But Tony assured me that this granary was worth a look. Our trusty guidebook invited us to be there for sunset, and it looked like we would just barely make it. 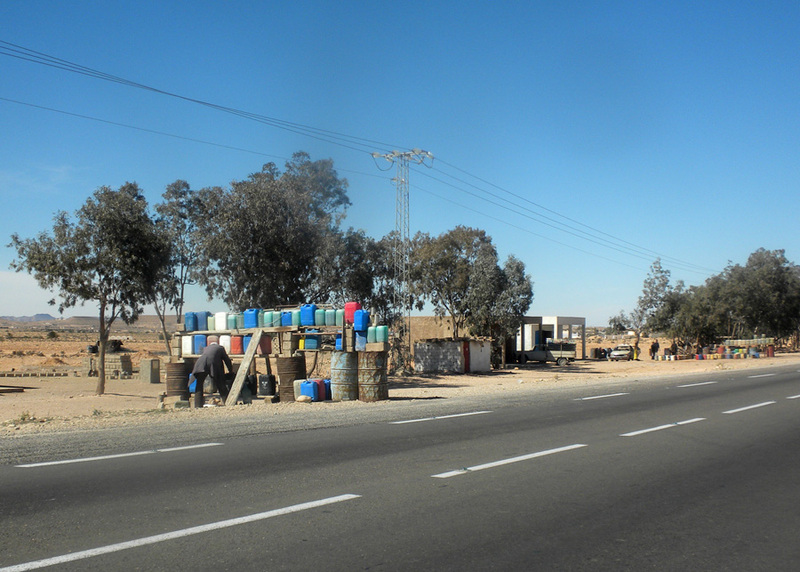 The road out from Tataouine was bumpy and full of potholes, and it went through several tiny Berber villages. We also passed a few fortresses on hilltops, and signs for several more. I believe you could spend a week or more exploring the surrounding countryside, and find new treasures every day. In the end, we did make it to Ksar Ouled Soltane just before sunset. The final rays of the sun glanced off the walls of what looked like a fairly formidable fortress. Inside was the real magic. 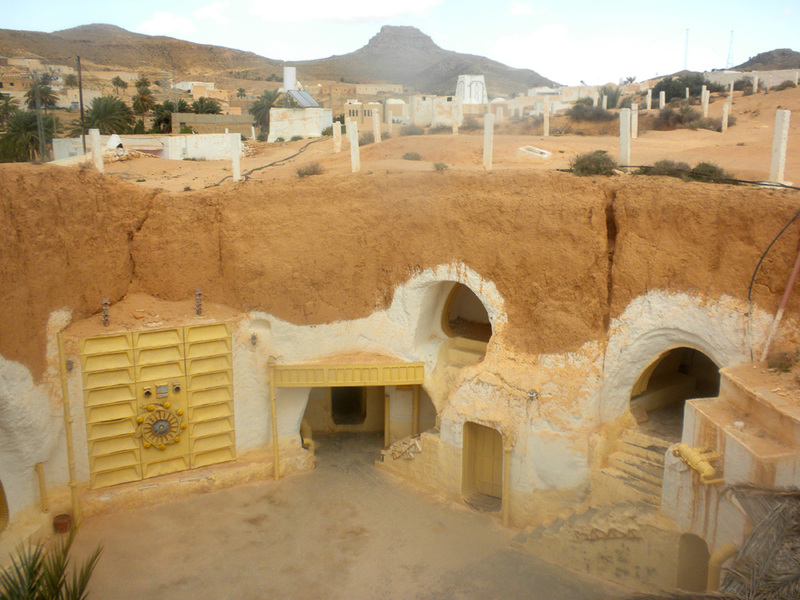 Other than in a Dr. Seuss book (and in Star Wars, Episode 1, where it served as the slave row containing Anakin's original home), I had never seen anything like it. Two large inner courtyards were surrounded by a perimeter of multi-storied little towers, formerly used to store grain. The ones on top are accessed by improbably steep, crooked staircases. 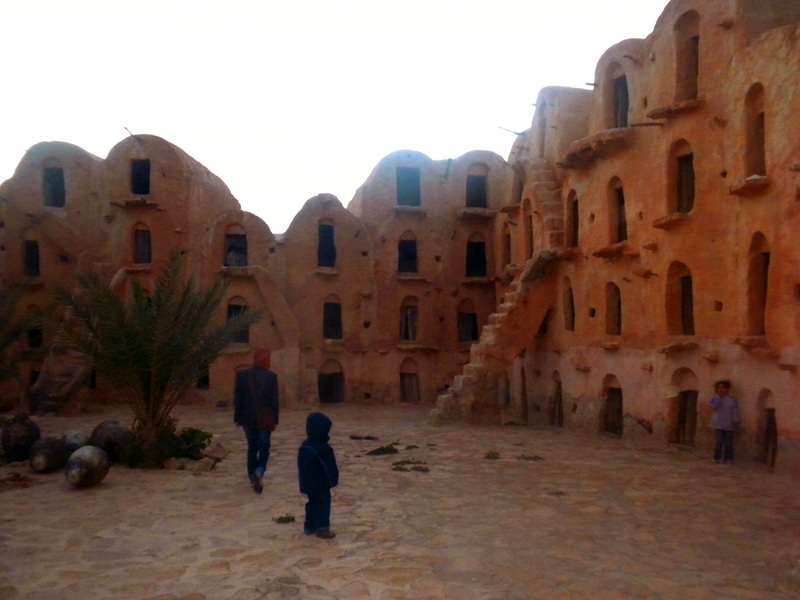 Hundreds of years old, these granaries were collectively owned by the Berber village. Each family had its own storage room, and the fortified granary could be easily defended against even the most determined assailing tribes. Now, some of the lower and larger units have been turned into small art studios by the young residents of the town, who sell lovely watercolor paintings of the unearthly structure. Tony bought one, and the artist carefully dedicated it to us on the back in beautiful Arabic calligraphy. Our sightseeing done for the day, we had only to find our hotel, which proved no easy matter after dark. We asked directions from several people, including a pair of soldiers who were walking through the streets, patrolling for trouble. They pointed us out of town, where apparently all the hotels are located, and looked at us as if we were crazy for wandering around as tourists after dark. Needless to say, this made us even more anxious to find our hotel. 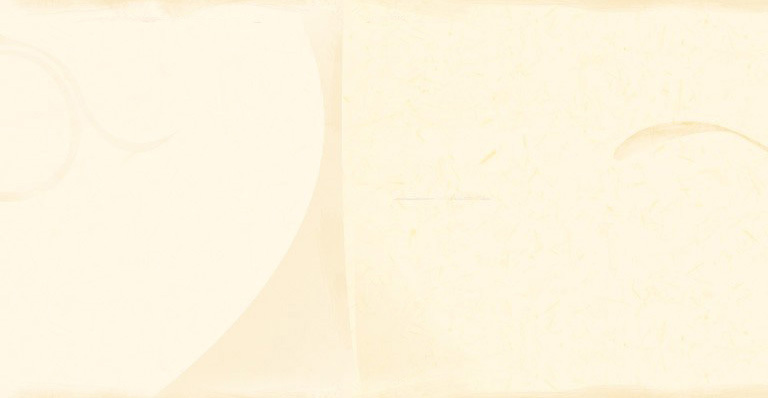 In the end, we never did find it. 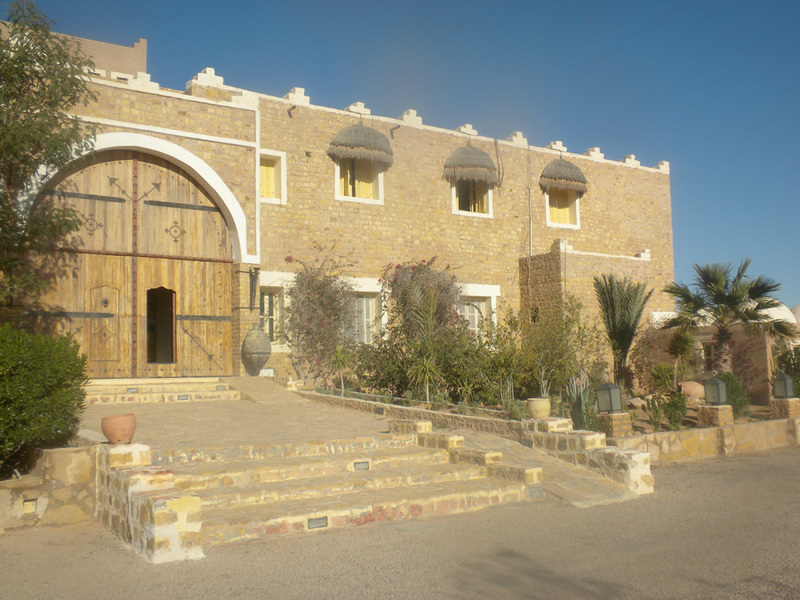 But we finally rolled up to another hotel (Hotel Dakyanus), six kilometers out of town. By this time, a full moon was shining over the silent desert. The security guard was incredulous that we really wanted to enter the hotel, but he eventually let us in. After they recovered from their surprise at our presence, the charming staff let our children stay for free, cooked us up a delicious traditional dinner, and even came out with cake and a birthday present for me. I opened it up to find a traditional Berber headdress, just like theirs. They helped me put it on, which involved a lot of rolling and tucking, and ended up as a bright red sort of turban that also draped over my chest. We went off to bed that night feeling like kings of the desert.